This was October's UFO project, and it is now a finished top. This was a leader/ender project from a couple of years ago. I had some blocks left over, so I decided to piece them into a back. Now all I need is a day or two free on the long arm, and I can get it quilted. It feels good to have another one move on to the "to be quilted" pile, and one step closer to being a completely finished project. The down side to that is I'm finishing tops faster than I'm getting them quilted, so that list is getting longer and longer. But I guess that's a good problem to have. Since I have a finish, and since it's Friday, I'll link up to Finish it Friday. How on earth did it get to be Thursday. Just 30 seconds ago, I was writing the design wall Monday post, or at least that's how it feels, and now it's Thursday. And not only Thursday, but the end of October, too. How did that happen? Time is going just way too fast. I'm back at presenting customer quilts, again, although I'm still not caught up. This is Christine's Love Letters quilt. The picture does not do it justice, at all. The quilt was made in lovely, soft neutral low volume colours. It was, unfortunately, quite a bright day when I took these photos, so the colour ended up washed out by the light. She used the envelope block to make this quilt, which is where the name came from. I believe it was intended as a wedding gift. It was quilted using a pantograph called Wild at Heart. Seems appropriate for a wedding quilt, with lots and lots of hearts. I'm back at working on my projects now, after a short break. I've got this month's UFO up on the wall. It's a leaders/enders project from several years ago, that has aged long enough. It's about halfway sewn together now, on it's way to becoming quite a lovely scrappy Irish Chain. The other thing up there is my Blooming Nine Patch, which is slowly coming together. I only work on it while I'm upstairs in the long arm studio, since that's where my design wall is. I find it easier to work on if I can take it off the wall one row at a time, and then put that row right back up again after sewing it, in order to make sure I didn't mess up the placement. After checking on the placements, I sew the rows to each other. Obviously, I'm working on it one half at a time. It's going faster, now that I'm getting down to the corner. I'm going to link this up to Judy's Design Wall Monday. Then I think I'll sew a few more blocks in the Irish chain into rows, and maybe work on a wallet pattern I bought on the weekend. Time for some catch up here..... three weeks since the last stash report, and the last slow stitching progress report. There have been advances in both. When I last showed this block, I was pondering about the pink. I decided that pink was the way to go, but I chose one with less going on in it. I like the way it turned out. This is now number three of these blocks. The aqua is a bit darker in real life than the picture here shows. I'm having fun playing with fussy cutting for the center of these blocks. I'll be linking these up to Kathy's Slow Sunday Stitching. And now, for the stash numbers..... which has the added in numbers continuing to increase. And it has been a lot of fun, and quite satisfying to increase those numbers, considering I have projects in mind for all of the additions. I'll link up to Judy's Stash Report, and then I think I'll just sit here and relax with some more hand stitching. The skies are bright blue, and the sun is shining gloriously. It's not quite warm enough to sit outside and stitch. So I'll do the next best thing..... pull my recliner up just a bit so that I'm right beside the window. That way I can stitch and enjoy the colours of the leaves at the same time. The leaves are falling very quickly now, and it looks like it's raining gold......... just beautiful. There actually isn't much news. I've been in recovery mode since the quilt show, and all the work it entailed. I actually missed going on Saturday, since I wasn't feeling at all well. I saw the doctor on Thursday..... he seems to think I have an ulcer.... of all things. There is a trip to a specialist and an endoscopy in my future...... shall we all say YUCK!!. Anyway, enough of that. I'm doing better than I was, and we'll leave it there. Gail and I went on a small fabric acquisition road trip today, out to the store Cherished Pieces in Tillsonburg. She needed some flannel for a quilt back, and I needed some Kona Snow for a swap Jannette and I are planning for the new year. And while I was there, I picked up some Kona grey as well, that I have plans for, come the new year. I've been concentrating on UFO finishes this year. I'm thinking next year will be a using up scraps and strips and strings year. I'm thinking of a scrappy type quilt, using 1 1/2 inch scraps and 3 shades of grey as background. this barn quilt. The colours are terrible in this picture. I have no idea why the camera in my phone decided that the sky was yellow. It's actually a lovely, blue sky sort of day. Right beside this barn was this intriguing little antique shop called The Henhouse. We decided to stop and check it out. I didn't take any pictures of the inside. It was crowded, and nothing really caught my eye and said "take me home", but it was a fun adventure. And there was the cutest litter of kittens...... all grey and soft and cuddly. For the rest of this evening, I think I'm going to concentrate on putting together the Irish Chain quilt that was designated as this month's UFO. I just might make it. and the second is well on it's way. Now that I see the pink beside the other pieces, I'm second guessing that one. What do you think..... I'm think of maybe changing the pink to a medium to light purple. Yesterday was spent putting the binding and hanging sleeve on my Camp Out quilt. I can't get a decent picture of it, since it is pouring down rain outside, and there isn't enough space in here to spread it out. It will be hanging at the quilt show, so maybe I can get a picture of it hanging there. Then the rest of yesterday was spent knitting and finishing watching the Harry Potter marathon that was on all weekend. Today, I've loaded on a quilt of Charlene's that's been in my studio, waiting for months, literally. She didn't need it for the quilt show, so it got set aside to age a while longer. Plus, it took me a while to figure out what I was going to do with it. Now that it's loaded, it's talking to me. There are seven lady blocks, and two plain ones, which will have a feathered wreath in them. I suspect it's going to have to wait a while, again, since the run up to this weekend's quilt show begins tomorrow. If anyone can make it, the show is this weekend. This is the flyer for the quilt show. You can biggie size the picture to see the details of where and when. Hope to see you there. In between the mad rush life has been lately, trying to get ready for the quilt show, I've been snatching a few minutes here and there, mostly when in the car as a passenger, to do some knitting. My On the Grass sweater is finished. I like the yarn, I like the sweater..... I dislike the way the sleeves were done. No more picking up stitches and doing short rows for sleeves in my life. Don't like it, not one little bit. I'd never done it before the last two sweaters I made. The first one, I thought it might be just because it was new, and I'd get used to it..... but nope, after the second, I've decided I don't want to get used to it. I'm really itching to start another sweater, but I think I need to get started on some seasonal knitting instead. Last winter, when Scott and I would go out for a walk, or even just in the car, my feet would get so cold, that they would ache so badly i wanted to cry..... I have Raynaud's Syndrome, which causes the blood vessels in my hands and feet to spasm when exposed to cold. So, I've decided to make myself some worsted weight wool socks to wear inside boots, using some leftover yarn from my green hoodie sweater that is so warm and so soft. I'm going to need new boots this year, but I can't buy them without having the boot socks done to make sure that the boots will fit with them on. And then, I have a request for slippers for Rebecca. And I want to make another sweater for Avery for Christmas. He is a Thomas the Tank Engine fan, big time. I'm going to try and adapt a cross stitch design into an intarsia knitting design for the from of a sweater for him. Pictures will follow, providing it works. 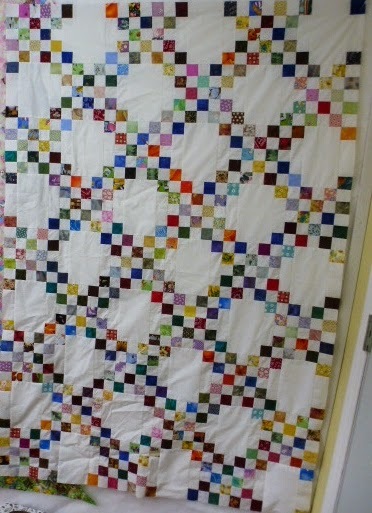 This is Christine's version of the mystery quilt that our guild did a couple of years ago, along with a nine patch swap. I have seen quite a few of these now, and each one is gorgeous and so unique. A great demonstration of how one quilt pattern can result in so many different and wonderful quilts. I think quite a few of them will be on display at the quilt show on the 17th and 18th of this month. Here's a close up of the fabrics that Christine used. It was quilted using the Botanical Gardens Pantograph. Here's another fun quilt with fabrics that make me smile. Jacqui says that she participated in a swap for word fabrics. She then used those fabrics to make this quilt. It was so much fun seeing all the different fabrics as the quilt advanced on the machine. It was quilted using a Square Spiral design by Keryn Emmerson. I use this particular quilting design a lot. It's very versatile. I think in this case, the diagonal lines in the quilting design really help to compliment the diagonal design in the piecing, as well as the motion in the tilted pinwheels. You can bigger size the picture here, and see what I mean by the fun fabrics. I have the next UFO that I want to work on up on the wall today. It's an old leader/ender project that was started back in January of 2012. It's going to be a large Irish Chain when it grows up. I'm hoping to keep up the finishes I've been doing with my UFO's this year, and get this one done this month. All the chain blocks are done, so it shouldn't take too long to get the rest of it put together. However, there are hanging sleeves to go onto two more quilts before I can sit down and work on this. I'm linking up to Judy's Design Wall Monday, then it will be time for some supper and some hand stitching on a couple of hanging sleeves. I missed last week's stash report, since we were away camping for the weekend, and I didn't bring my numbers or my internet stick with me. So, these in numbers are going to be rather high. They reflect a fabric acquisition road trip and also a stop in a fabric store while we were away camping. It's important to support the local economies, after all! And then, also in the past 2 weeks, I had an internet order come in....... yikes!! This is the internet order, some more diagonal stripes that I love for bindings, and also a plaid that I think will work well for binding. 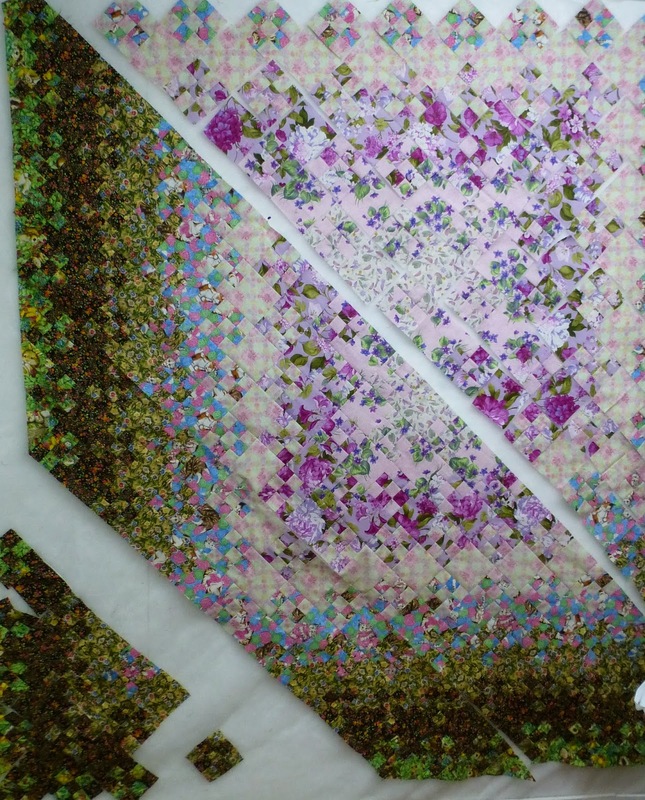 And then a bunch of fat quarters of large scale florals, that will end up in some disappearing four patches and also another Judy Martin pattern I have my eye on. And, with the quilt show coming up, and vendors at that quilt show, I'm sure there will be yet some more added. Lots and lots of fun!! The out numbers reflect the finish of some binding, lots of 2 inch scraps used for a piano key border, and the backing for Camp Out. And also, since September's UFO is now a finished top, I pulled out another UFO from my list, and cut the fabric I need to work on it. I can link up to Kathy's Slow Sunday Stitching this week. I've been tempted into another new project by Teresa and her Patchwork of the Crosses blocks. Part of those stash added numbers, acquired during above mentioned road trip, went to fabrics that I thought would be good for fussy cutting in this project. I'm having fun playing with the fabrics, although this is the only one I have cut out so far. I'm finding it a bit of a struggle to work around the card stock papers, but I'm sure I'll get the hang of it. There will be more of these showing up in the weeks, and most likely months, to come. I've seen quite a few layouts of this pattern all done and into a finished quilt. Each block framed with white honeycomb shapes, then a row of dark squares in between them, and a small corner cross at the intersection of the rows. There's an example of it here. However, there is a long way to go before I get even close to that. I've already added the link to Kathy's page, and I'll also link up with Judy's Stash Report. I've said it before, but it bears saying again, that one of the best things about quilting for other people is the opportunity to play with their fabrics. 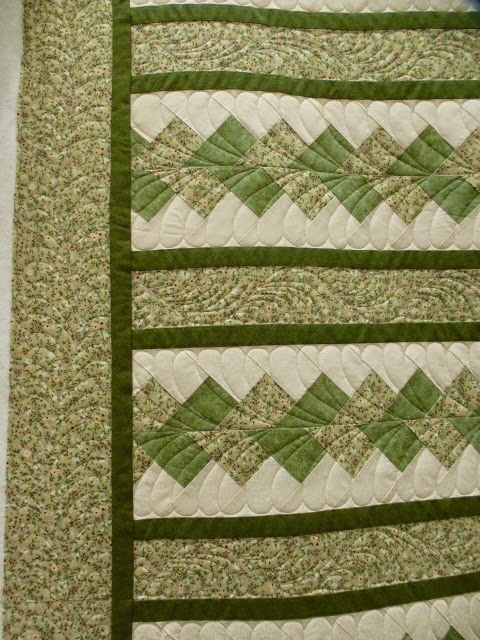 The last quilt I showed was a peaceful and serene monochromatic green colour palette. This is so much the opposite. It is bright and vibrant and quirky and just plain fun. Just look at all those delicious batiks! 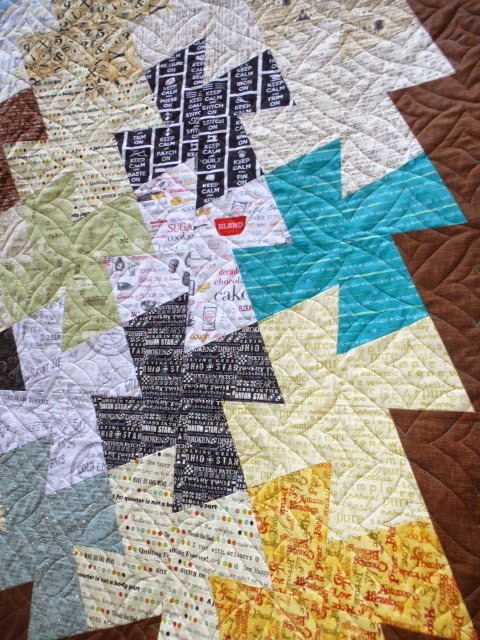 There is so much going on in this quilt that any kind of fancy quilting would have gotten lost. Plus, it's such a modern looking quilt, that it needed something modern quilted onto it to complement it. So Alice and I agreed that using the pantograph Square Dance would be the perfect choice. The straight lines of the quilting design highlighted the straight lines of the piecing, and added in some delightful texture, and resulted in what, I think at least, a perfect finished project for Alice. 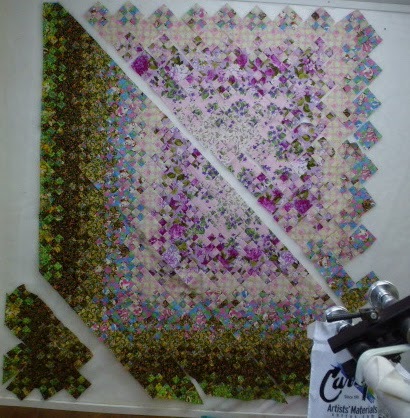 This was September's UFO goal, to get this quilt top done by the end of the month. I missed it by one day, and finished it on October 1st. So, I would say that goal was met. This is such a fun quilt. It used up some of the nine patches received from a guild swap a couple of years ago. I still have a pile of them left, so I need to decide on another use and setting for them. There are too many to use in a pieced backing. The setting fabrics I used in this are as much fun as the nine patches, and are what led to the quilt's name. The blue fabric has tents and trailers and campers on it. The light fabric was initially chosen because the colour worked with the blue. But now that I see how nice it looks, I think I'm going to try and figure out how to make curtains for our trailer to replace the hated mini blinds that never go up or come down without getting stuck and tangled. And the backing for this is just as much fun..... more campers and trailers. I'm going to quilt this up using a thicker than normal batt, and some bear tracks for the quilting design, to remind us of all the times we've gone into a campgrounds and come across this sign. 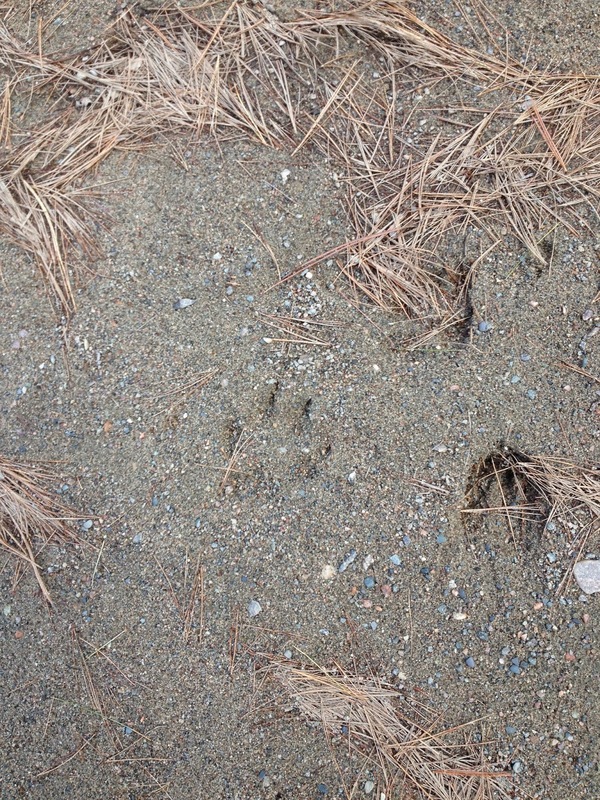 One year, when we were in Grundy Lake Provincial Park, at the very beginning of the season, we came across these tracks in the sand. They look an awful lot like bear tracks to me, but just a little one. This quilt is going to keep us lovely and warm come the next camping season. We are hoping for a trip out to the east coast next year. Information booklets that I sent away for are starting to come in, and the planning and dreaming begins. Well, I must say that, although I love being able to take the trailer and run away to the peace and quiet of the trees every now and then, it plays havoc with my blogging. It seems that, once I skip a day, it's easier to skip the next. Of course, trying to catch up on all the stuff that needs to be done afte getting back probably adds to that. But anyway....... it's time to try again. This is Chris' Chevron quilt. This was the first quilt I've done for her, and it was a pleasure to work on. The greens she used in this quilt are so soothing to the soul. As much as I love the bright and fun novelty quilts, I also love monochromatic colour schemes as well. This quilt was a perfect opportunity to do my most favourite thing to quilt...... feathers. There are full feathers in the chevron areas, and then one sided arcs of feathers in the printed areas. And, of course, feathers in the border all around the quilt. I stitched in the ditch on either side of the dark green fabrics, and then left them to stand on their own and act as a border between the feathered areas of quilting. I've still got these two projects going, my Blooming Nine Patch and my camping quilt. I've made progress on both of them. There are more rows sewn together in this Blooming Nine Patch. The more of it I get sewn together, the better I like it. And Camp Out now has all of its piano key borders sewn together. I just need to check on the sizing for them, and I can get them sewn on. I think they might be a bit too long. I might do some liberated style sew them on and cut to fit, if they are really way out. Camping quilts are allowed to be slightly wonky. That's a new rule..... I just made it up. My computer seems to be acting up a bit, and won't open the pages to the link ups, so I'll skip those for this week.